"Straight as a die" - that is the most characteristic summary of Sagittarius nature. Sagittarians are hearty people, who arouse respect and embarrassment at the same time in the society. Sagittarians statements correspond to their straightforward nature to comment others aptly but carelessly. If they shoot arrows around, they smile but you would be in in low spirits very soon. Sagittarians are confident and despise conventions. They refuse to accept the seriousness of life. Sagittarians strengthen friendships with those who deserve it. They often do not grow lasting relationships and family ties that should outlast the centuries. If you want to share a life passion with a Sagittarius, let him/her know, that your spirit is free. Persistence is not entirely in accordance with the freedom of the Sagittarius nature. They are willing to take risks rather than wait and build something step by step. However, there are exceptions. Sagittarians throw themselves into romantic adventures without thinking. However, they should get some credit for the generosity with which they treat everyone they respect or like; and they always find an extra place at their table. Male Sagittarius is an idealistic enthusiasts. Beware of his sincerity. Female Sagittarius is acheeky dragon. As a man you have to impress such a woman by your courage and ingenuity. Sagittarians are often convinced that they are the best diplomats under the sun. At the same time they can surprise you with shocking statements which they say with absolute innocence. "Wear one's heart on one's sleeve" – this is the best summary of the Sagittarian characteristic. It is a good-natured archer who arouses respect and embarrassment at the same time. Sagittarius people are not spiteful, but their flippancy and sincerity can disarm many people, even friends. When the Sagittarius will shoot the arrows around, he or she will smile while your laugh will probably be soon over. To better imagine his / her common attitude – Sagittarian's statements correspond with the characteristic straightforward ability to aptly, but often also tactlessly comment everything around, eg . : "Today you look much better than last time, that you had greasy hair and the old turtleneck. You are really making the progress!" or "Have you finally got to the school? I think you will be completely gray before the graduation." or "The egg spread on your sandwich is really good. Hopefully breeders got rid of the salmonella which was last year still widespread." Sagittarius often jumps to conclusions. They can spew many shocking judgments and look totally innocent. It is often really strange how so clever person can be sometimes blind to own statements. And yet these archers often believe that they are the greatest diplomats under the sun! Unfortunately the Wild West saying "shoot first, ask later" is more appropriate by them. But you will never be angry with them when they apparently lack the malicious intent. The endless optimism is a characteristic feature of this zodiac sign. Sagittarians are usually self-confident people who despise conventions. They refuse to accept the seriousness of life. They are bold and they seek the adventure or even danger because their element is fire. Therefore Sagittarians are usually extroverted. Those who live in seclusion you will find only sporadically, but those archers characteristically have also fantastic dreams and high aims. They are not hopeless dreamers. Such Sagittarians will present their plans to others only when they are confident of success. If some Sagittarius becomes a hermit for a short time, it is usually a very good opportunity to sharpen his / her wit to absolute brilliance. 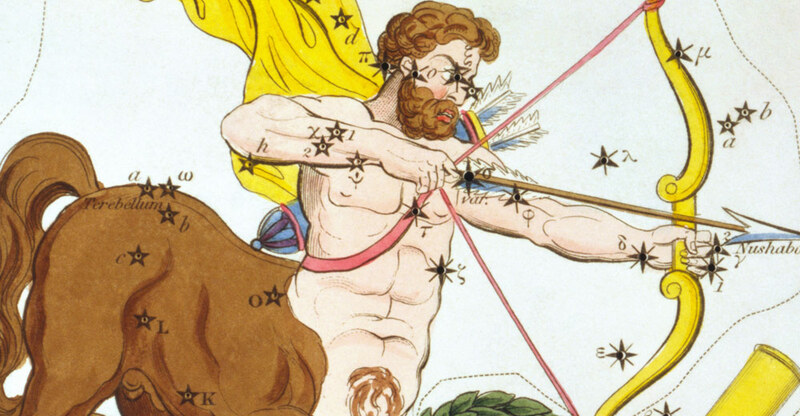 People born under the sign of Sagittarius are visionaries who are often ahead of the time. The very brilliant idea, however, is only half the battle. Unusually, if the Sagittarius does not have a favourable constellation of planets in the horoscope, he or she may face to problems and be unable to successfully realize all the sparkling ideas. Unfortunately, endurance is not very characteristic for them (on the contrary broad-mindedness is the very characteristic feature for Sagittarius). They are willing to take risks rather than to wait and slowly build the „magnum opus“ step by step. Sagittarians often plunge into love affairs without thinking. But, at the same time, they are generous to everyone that they respect or love, and they will always find the extra space at the table for an unexpected guest. The Sagittarius man is tolerant, sincere and honest. He is always involved at the heart of matters. He is a team leader and is respected by others. Truthfulness is the well known personality trait of the Sagittarius man. But sometimes, unconsciously, his boundless sincerity hurts others. And from time to time the Sagittarius man can overreach the limits and get hurt. Sagittarius men are idealistic and do not lack the enthusiasm. Their exuberance, however, can sometimes get out of control. Beware of their sincerity. It is a very distinct personality trait of this expressive zodiac sign. If you ask such man, just by the way, how many acquaintances he had and how long they lasted, Sagittarius will unashamedly tell you everything. Maybe you will have even to stop him before he starts to portray all the spicy stories related to his previous intimate life. Of course, certainly not all men born under Sagittarius are tactless, but the usual jovial friendliness is a typical personality feature of almost all of them. Sagittarians often do not prefer lasting relationships and family ties that should outlast the centuries. But they consolidate friendships with those who deserve it. When they feel that the spark of the relationship vanished, they point the arrow elsewhere. If you want to share the enthusiasm with him, let the Sagittarius man know that your spirit is as free as his. Optimistic, curious, cheerful, adventurous and dynamic – such is the typical Sagittarius man and his best known personality traits! The Sagittarius woman is honest and does not pretend anything. Although her personality is often more materialistic rather than spiritual, she is not afraid to admit it. That is also the reason why Sagittarius women have more friends among men. The woman born under Sagittarius is active and very often involved in sports or other kind of „movement” or enterprise in general. Her relationship to the family life is usually slightly indifferent, but she loves her children above all. The Sagittarius woman reminds the talkative female dragon more than the shy and submissive maid. Your ego will have to prepare for many of her inappropriate, but funny and true remarks. The sincerity is a very distinct personality trait of this expressive zodiac sign. The Sagittarius woman can easily say to you during the dinner at the first meeting: ”Do you not mind that you are an inch shorter than me? Well, anyway, it seems that you are handsome and smart!” And before you could swallow or blush, she will remark again: “Do not worry, I do not mind. A lot of great men are small. Maybe Napoleon, Frodo, Tom Cruise or Papa Smurf.” And giggling begins to eat the spaghetti. The Sagittarius woman knows that if you are not able to bear such dose of sarcasm and sincerity at the very beginning, you would run into troubles soon anyway. Sagittarian women love to travel. The independence is often a typical personality trait of most of them. It is not difficult for them to live alone, at least in comparison to other zodiac signs. Because they usually have enough courage and enthusiasm, you as a partner will have to dazzle her with gallantry, ingenuity and fortitude. If she wants to complain the broken iron just one day after the warranty ceased to be valid, be sure that the Sagittarius woman can handle it alone. But it is also a big challenge for you, if you can gain the necessary respect in her eyes as a capable man. It is up to you to convince the retailer. To explain that the iron get round the globe twice in last 24 hours, and therefore, thanks to the time-shift, the warranty extended at least another two days. In any case, you need to try and prove that the problem of iron is the least trivial thing you can handle! Enterprising, curious, adventurous and ambitious – such is the typical Sagittarius woman and her best known personality traits. This woman is not a typical housewife and her career may be often primary, but if she gets tired of the clapping of colleagues or other exhausting social events, she can start to consider home as the welcomed haven, the place of necessary peace and security.